The proximity of the Maine River was an important factor in the establishment of the Hôpital Saint Jean. In the Middle Ages, there was no garden on its grounds and the complex stretched to the river’s edge. 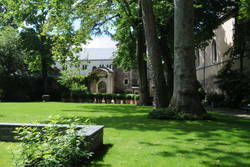 The courtyard surrounded by buildings along the Boulevard Arago, a former branch of the Maine, was filled in in 1878 to create this garden and the neighbouring Place La Rochefoucauld. In order to evoke this period, a medieval-style ‘hortus conclusus’ or ‘closed garden’ was created on this site. 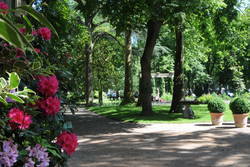 In 2007, the city of Angers decided to renovate the gardens. It wanted to create a link between the historical buildings and their leafy environment, to personalize the spirit of the place and to make it attractive for the public. -a ‘hortus’ or vegetable garden used for food. This is where herbs and roots are grown. -a flower garden with plants used for making up bouquets. -a medicinal or herb garden called a ‘jardin de simples’ in French, coming from ‘simples’ denoting the medicinal plants used to cure the sick. In the past, it was often located close to the infirmary and was composed of ‘squares’ where plants were grown in relation to their medical use.